Mary Fran has been designing websites since the days of animated GIF's and frames. She is the owner of Purple Crayon Web Studio in Chicago where she spends too much time on the internet looking for better fonts and and writing jQuery plugins. Editor’s Note: Today’s guest post comes from Mary Fran. She’ll be guiding you through the proper planning involved in projects with larger amounts of content. A major project can be intimidating. The first time you take one on, it may even be terrifying. But with a little planning, you will succeed with flying colors. In this article, we’re going to walk through a few of those steps to successful project management. Who will be responsible for the site content? Where is it being saved? How should it be named? How are you going to track versions? What members of your team are responsible for what tasks? These are a crucial considerations in the beginning of any project, and if you skip them now it will be very difficult to work with large amounts of data later. Once you have decided on a workflow, it’s time to get your assets in order. Make sure that there is a clear direction of where your files should be going, and what they are named. This is an important and logical second step in order to keep files organized in future stages. The “Client Files” folder is just what you would expect. It contains all files that the client has submitted to us for use in the project. Typically clients provide content, product images, and logos. I sub-divide the “Images” and “Logos” folders because we edit the files after we receive them, but we do not typically edit the text. If you are saving files to something such as Basecamp, documents should be a Word document, placed into a specific category (e.g. “Site Content”) for filing, and named after the page it belongs on. If you’re using an FTP server, naming the files is a little more crucial. Something similar to Site &gt; Text &gt; HomePage_3October.doc contains a date so that you can make sure that you are using a current version. This allows the content creator to go back to specify a version easily. Additionally, if you are building an e-commerce site, requesting data from a client in a spreadsheet might just come in handy. The columns you end up with will be unique to your project, but they will at the very least be: Product ID, Product Name, Description, Price, Options, Dimensions, Image File Name. Having this reference will be invaluable as you are spending that day inputting the data into your site. How are pages going to relate to each other? If this is a really large site, how are the categories going to relate to each other and then pages within a category going to relate (relationships only need to be defined in one category if all categories are going to contain similar relationships). There needs to be a site overview listing all categories and subcategories. You can go back into your main folders and create sub-folders for your categories at this point. By having a graphical or outlined site plan, you and the client will have a better understanding of how the site is going to progress. Now that you know exactly what the pages are and how they relate, you can begin to define the page types. It’s easy to undervalue this step, but it is important not to. It lets you refine the site plan and formulate an effective ask for data and content. What types of pages are you going to have? What kind of forms are needed, and where does the information go? Is there a database in play? What data do you have available or finished? Once you’ve completed the previous sections, it’s a good idea to inventory existing content. Verify that you have the pictures of products or people that you requested, that all of the descriptions exist and that they follow proper format. Something missing? Go back and check your sitemap and project folders. 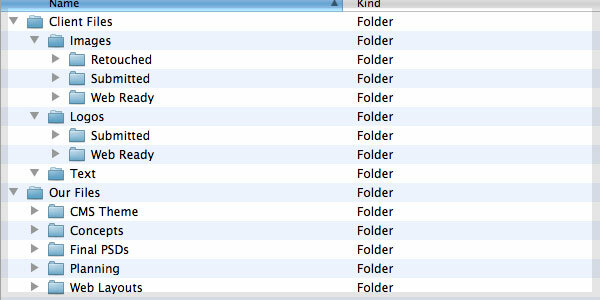 Making sure you have all the data that you need tucked away neatly into proper folders will prevent headaches and holdups when trying to finish up the project. Make a calendar. Put deadlines on it. This will help you focus and keep the project on track. Managing a large project can be a bit like training a cat — seemingly impossible for an untrained person, but with careful planning and persistence, it will be successful. Excellent post! I’ve never really thought about such large sites much. .-= Eric B.´s last blog ..Creating an Awesome Website Design With Gimp =-. .-= designfollow´s last blog ..How to Plan a Content Heavy Site =-. Planning is what distinguishing amateur programmer or designer from experienced one. Great article. The project management of large scale sites is something that isn’t often considered, a lot of the comment and advice you see online is about designing blogs or small sites of 5-10 pages. Larger projects are a whole different ball game though, and you need to be far more focused and organized. Really appreciate the suggested file structure. That’s always been something I’ve found tough when working on large scale projects, the degree to which my resource files get cluttered and disorganized so quickly. Definitely going to look at implementing something similar to your structure. .-= Robin Cannon´s last blog ..Styling JomSocial – A Blank Canvas Template =-. Well planning is a basic series of step to began any type f work .If u had plan it properly than you will not face any big problem. Thanks for the post. At my day job, we have a huge site and in the past it has been difficult to manage at times. In-house staff is primarily responsible for design and content and web management is out-sourced. These tips will be good reminders that I will share with both groups when issues arise. .-= Ileane´s last blog ..Do Twitter Backgrounds Attract New Followers? =-. Content Strategy for the web is a great book to help you gather and organize your content for a website. Nice tip…I am learning to much. .-= Q Ball, The 800lb Gorilla´s last blog ..Cuban Hip Hop: The Next Revolution =-. Great article, very interesting read. I am planning to start a content rich site and this post helped me in getting loads of ideas about how to organize design and develop a content enriched website that has function like a blog. Thanks for this excellent piece of information. excellent piece of information. And i like the pictures that are very representative of the content. Nice article! I think a more detailed one would have helped a lot of us here. .-= Hitesh Mehta´s last blog ..HiteshMehta: Getting Clients to Embrace Fresh Ideas http://bit.ly/1EQ5l6 =-. Liked “A Sample Folder Structure.” saves heaps of time. .-= Webanddesigners´s last blog ..Create Mobile Version of Blog: 12 Free Alternatives =-. It become more difficult when you have various kind of content like videos, photos gallery, etc.. Your article was excelnelt and erudite. I also think it’s important to decide whether or not a CMS is needed for a large content site. You can then dictate how content is added and organised in the future. Setting privileges for who can edit what is really helpful for controlling the beast too. Great tip on how to structure local folders! Thanks! wow great job, really thanks for this informative article. Definitely this is a great post! it’ll help me a lot. Really good tips for structuring the local folders, this is one of the tasks which I find difficult, while working for huge sites. Great stuff Mary. Thanks! This helps me with my organization. Its easy to skip those first steps and you end up regretting it later when you are missing information that is needed. Great blog Maria, looking forward to create such content rich websites.